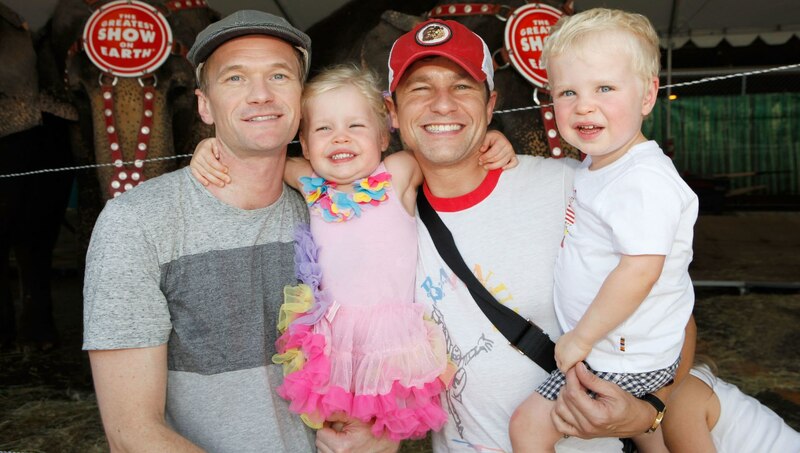 Neil Patrick Harris and David Burtka, can you please adopt us? Seriously, we can’t think of two cooler dads — especially when holidays come around. Exhibit A: Check out Burtka’s freaky-fantastic Instagram slideshow of the whole family dressed as an old-timey circus “curiosities” act. Burtka captioned the post, “Trick or Freak… plus out takes.” That’s right, Team NPH-DB has dressed up as a bearded lady, a strong man, a really creepy clown, and a deranged ringmaster. To be honest, the couple’s twins — son Gideon and daughter Harper, who are now 7 — have enjoyed seriously awesome Halloween costumes every year of their lives. We didn’t think they could top last year’s, when the fam dressed as a foursome of Hollywood legends: Marilyn Monroe, Groucho Marx, Charlie Chaplin and James Dean. Oh, to be part of this creative posse. We’re already dying to see what they come up with next Halloween. Dr. Horrible’s Sing-Along Blog costumes, perhaps?